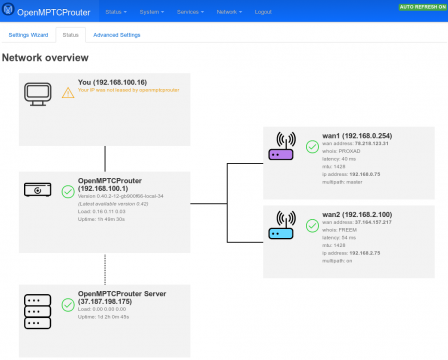 OpenMPTCProuter use MultiPath TCP (MPTCP) to really aggregate multiple Internet connections and OpenWrt. A simple diagram to describe how OpenMPTCProuter is working. OpenMPTCProuter VPS v0.55 update to kernel 4.14.73 with latest MPTCP changes. OpenMPTCProuter VPS v0.46 updated with latest MPTCP changes.